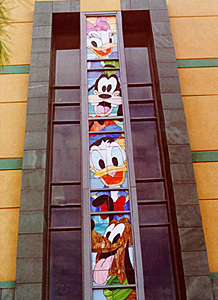 Arts Stained Glass in 1995. Ancient Arts produces select commissioned art installations for large commercial projects. Please call us at 310.832.7613 to discuss your upcoming project. Ancient Arts Stained Glass Studio designs, fabricates and installs custom decorative glass windows for large commercial projects. Head designer and Ancient Arts' owner, Mark Schoem, supervises all commissioned stained glass art from preliminary design through installation. In business since 1980, Ancient Arts has created numerous commercial projects for clients throughout Southern California. We collaborate with architects, contractors and interior desingers to create custom stained glass installations of lasting beauty. If you are looking for the highest quality, authentic stained glass windows for your business or public institution, please call us to discuss your upcoming project. for churches and other religious institutions, commercial and residential clients. Located in San Pedro, serving Los Angeles, Riverside, San Bernardino and Orange County, Southern California.